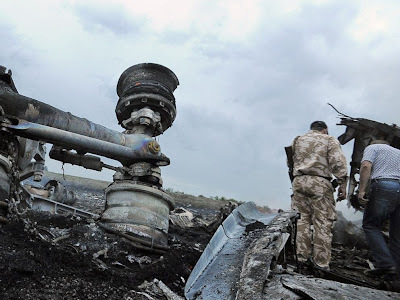 KIEV, Ukraine -- A Malaysia Airlines passenger plane with 295 aboard was shot down by a surface-to-air missile in Ukraine near the Russian border a day after a Ukrainian military jet was downed, Fox News has confirmed. Pro-Russian rebels explore the wreckage of the Malaysian airliner that crashed in east Ukraine while traveling from Amsterdam to Kuala Lumpur on July 17, 2014. The Boeing 777 bound for Kuala Lumpur from Amsterdam was shot down at cruising altitude about 35 miles from the border, according to Anton Herashenko, an adviser to Ukraine's Interior Minister. He said all 280 passengers and 15 crew members were killed. A Reuters correspondent near the scene reported seeing burning wreckage and bodies strewn across a nine-mile debris field. A Ukrainian Emergency official told the news agency body parts and at least 100 bodies were seen in the area. The flight manifest reportedly included the names of 23 Americans, though State Department spokeswoman Jen Psaki said at a briefing Thursday, "we don't have any additional details at this point on American citizens" aboard the plane. "Obviously, we're seeking that information as we speak," Psaki said. An AFP journalist at Amsterdam's Schiphol airport – where the plane had taken off -- said distraught family members were in tears, according to The Telegraph. The incident touched off immediate finger-pointing between Russian separatists and the Ukrainian government. Eastern Ukraine separatist leader Alexander Borodai told Reuters that Ukrainian military forces shot the jet down, but Kiev denied involvement and labeled the incident a "terrorist act." "The President of Ukraine on behalf of the State expresses its deepest and most sincere condolences to the families and relatives of those killed in this terrible tragedy," said a statement released by Ukrainian President Petro Poroshenko's office. "Every possible search and rescue effort is being made." Separatist groups reportedly blocked Ukrainian officials from the scene, and later said the "black box," or flight data recorder, had been sent to Moscow. KT McFarland, a former deputy assistant secretary of defense under President Ronald Reagan, and a Fox News national security analyst said the attack was most likely the work of Russian separatists, not the Russian or Ukrainian armies. “I think it’s far more likely it was rebel forces in eastern Ukraine trying to get the Russians back involved," McFarland said. But retired Army Lt. Col Ralph Peters, also a Fox News contributor, said it is unlikely the Russian military would have put missile batteries capable of knocking a plane out of the sky at such an altitude in the hands of rebels. "It wasn't the separatists, although Russia will try to blame them, or blame the Ukrainians," Peters said. "The Russians have not given the separatists complex, high-altitude air-defense systems. If this airliner was flying at 34,000 feet or any altitude close to that, it was shot down by Russian military air-defense systems perched on the Ukrainian border." Peters said the Russian military has been shooting down Ukrainian military aircraft in recent weeks, and most likely mistook the airliner for a Ukrainian military aircraft. "Russia has a small number of elite forces, but most of the Russian military is ill-trained, sloppy and marginally disciplined.," he said. "With no Western response to them shooting down Ukrainian aircraft, they just got trigger happy." It appeared to be at least the third plane downed in the area since Monday, when a Ukrainian An-26 cargo plane was shot down. Late Wednesday, a Ukrainian Su-25 fighter jet crashed, though it could not be confirmed if it was shot down. Just before the Malaysia Airlines plane went down, Russian separatists reportedly boasted of shooting down another Ukrainian cargo aircraft. The airline, which saw one of its fleet disappear over the Indian Ocean in March, confirmed only that "an incident" had occurred involving the Boeing 777. “Malaysia Airlines has lost contact of MH17 from Amsterdam," read a tweet from the airline. "The last known position was over Ukrainian airspace. More details to follow,” read a tweet from Malaysia Airlines’ account. Herashenko wrote on his Facebook page that Malaysian Airlines Flight 17 was flying at an altitude of 33,000 feet when it was hit. The missile was believed to have been fired from a Russian Buk launcher. A similar launcher was seen by The Associated Press journalists near the eastern Ukrainian town of Snizhne earlier Thursday. The Ukraine military is believed to have the launchers, but the Russian military, which has backed the separatists, has them and also may have given them to separatists. The Donetsk region government said Thursday's plane crashed near a village called Grabovo, which it said is currently under the control of armed pro-Russian separatists. The area has been a flashpoint to the larger dispute between Ukraine and ethnic Russian separatists. Fighting has intensified in recent months in the region. "I was working in the field on my tractor when I heard the sound of a plane and then a bang," a resident of Hrabovo told Reuters. President Obama said the incident "looks like it may be a terrible tragedy” and that the administration is working to determine whether American citizens were on board. He noted the national security team is in close contact with the Ukrainian government. Rep. Michael McCaul, R-Texas, chairman of the House Homeland Security Committee, said whether it was intentional or accidental it is an "international incident" when a passenger jet is shot down. McCaul said he believed only a military grade weapon could have downed the plane. The Boeing jets are equipped with twin Rolls-Royce Trent engines, typically cruises at 35,000 feet at speeds up to 639 miles per hour. “Our thoughts and prayers are with those on board the Malaysia Airlines airplane lost over Ukrainian airspace, as well as their families and loved ones,” Boeing said in a statement. On March 8, Malaysia Airlines Flight 370, also a Boeing 777 and carrying 227 passengers and 12 crew on a route from Kuala Lumpur to Beijing, disappeared somewhere over the ocean. According to SBU information released on channel 24 Ukraine SBU intelligence has wire tapped recordings of a insurgent of Russia working for the Insurgent leader known as the Devil telling a FSU representative that he had shot down a commercial Airliner. Also included are intercepted Texts indicating that Insurgents are in fact responsible for the Downing of the Airliner. Russia is now implicated by giving the separatists a sophisticated AA system capable of shooting a plane cruising at 30,000 + feet altitude. at over 600 MPH.